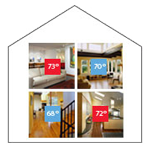 Zoning can provide optimum comfort with increased energy savings in your home by dividing a home into areas with similar heating and cooling needs and independently controlling the temperature in each area. Much like multiple light switches that independently control lighting in different rooms, with zoning, multiple zone thermostats or sensors control temperature in different areas of the home. Contact us for an in-home evaluation and estimate.